Raised with apathy and spite, Amy’s life is a monotonous drone of deep despair, broken only by coffee and nights out with her best—and only—friend. She battles depression daily, fighting to keep her sanity in a world that, to her, is set on destroying her soul. Her future is bleak, overcast with shadow and doubt; her past harbors terrible secrets that even those closest to her couldn’t begin to guess. When tragedy strikes someone she holds dear, will she succumb to the crushing weight of despair, or will she find the strength to fight—to live? 22 Scars is a story of what it takes to live daily with depression—and how the scars of a lifetime can pass through generations and beyond. Can the past ever truly be forgotten? Can depression ever be beat? 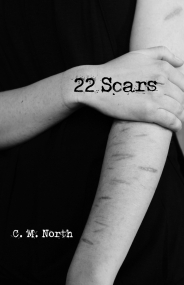 '22 Scars' highlights mental illness in teenagers. With recent events, I think a young adult book that focuses on mental health is an important thing. '22 Scars' did an excellent job taking on this difficult topic. I did read '13 Reasons Why' and found it somewhat lacking. Not only was the plot unrealistic and contrived, I don't think that it really approaches the underling mental illnesses that drives someone to suicide. I think '22 Scars' approaches this subject better. Not only is Amy's deep seeded problems explored but it also shows how her mental illness progresses through time. '22 Scars' has two storylines. The connection between these storylines is not realized until late in the book. I found both storylines interesting although I did find that the one not involving teenage Amy more interesting. The main issue I had with teenage Amy's storyline was the plethora of characters, especially Amy's friends. There were so many I could not keep them straight. Also, the character of Beth's father helped the reader understand that someone can have major flaws and still be an ok parent, he didn't really add a lot to the story other than that. I would have liked to have read more about Amy's boss. I felt like there was more to him as a character. From the few times he is mentioned he seems interesting and kind and I would liked to have heard more of his story and maybe, even his point of view. '22 Scars' is a wonderful story that takes on the subject of domestic violence, mental illnesses, and teen suicide. I really loved the way this novel approached each of these subjects. I highly recommend '22 Scars' and recommend it as an alternative to '13 Reasons Why'.